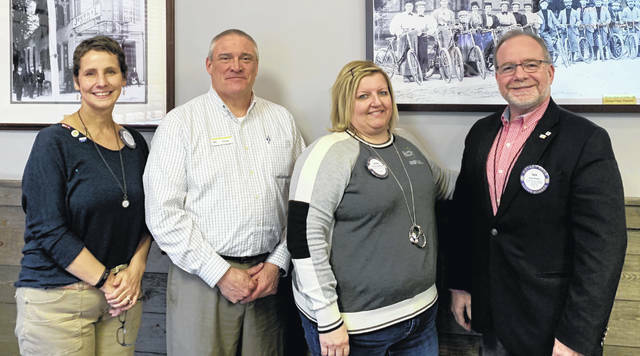 From left are Kathrine Harrison Tigar, Rotary President-elect; Doug Little, President of the Clinton County Convention and Visitors Bureau; Susan Valentine-Scott, Executive Director of the Clinton County Convention and Visitors Bureau; and Dan Evers, President of the Wilmington Rotary Club. WILMINGTON — Susan Valentine-Scott, Rotarian and Executive Director of Clinton County Convention and Visitors Bureau, spoke to the Wilmington Rotary Club which meets at noon at Damon’s Restaurant on Mondays. She gave several updates on the Clinton County Convention and Visitors Bureau: The Clinton County Convention and Visitors Bureau has a new logo and face for the marketing materials; a new visitors guide is coming out; and the CVB is producing a new video highlighting Clinton County. The Clinton County Convention and Visitors Bureau receive funds from the county through the Bed Tax, and in turn supports local events with those funds. In 2019 so far, $300,000 has been spent or pledged to community events, Valentine-Scott said.